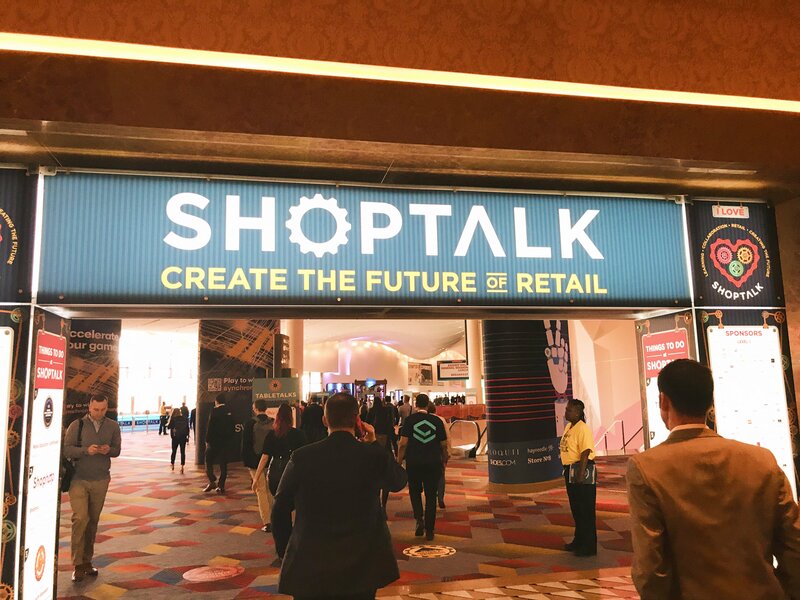 This Shoptalk 2019 recap is an edited transcription from our daily podcast ‘The eCommerce Minute. You can listen to the full episode in its entirety below. Listen to the eCommerce Minute on Anchor, Spotify, Apple Podcasts or wherever you listen to podcasts. John Suder: Shoptalk is the yearly retail industry trade show in Las Vegas. It draws attendees and vendors from all over the world. The show is not only for retailers, it’s for people in eCommerce, investors, and start-ups, and it’s great for anyone who’s business touches any part of retail, especially the underlining technologies that help businesses run smarter. The show floor features big tech companies like Google, Microsoft, IBM, as well as eCommerce platform providers like Shopify and Big Commerce. But for those who really want to learn what powers retail commerce, it’s best to spend time with the smaller, up and coming vendors towards the back of the show floor. These are the companies with the innovations that will help the next generation of retailers stay ahead of the curve. The show also features speakers and learning tracks, as well as several inspiring keynotes. And let’s not forget why most of us come and do shows like this – it’s for the networking. The show itself is a fantastic opportunity to network and meet other industry professionals. This year’s attendance was reported to be at capacity, which was 8,400. Shoptalk veterans know where all the parties are. If you schedule your night just right you can hit three to five vendor parties in a single evening, and being in Las Vegas doesn’t hurt. The conference is centered at the Venetian Hotel on the Strip, so there’s no lack of activities for those moments of downtime. Bart, would you like to tell us what your experiences have been? Bart Mroz: There’s definitely lack of sleep. John: Haha we’ll get to that – how many Shoptalk’s have you been to? Bart: Most of them, except for last year, right? Because you went last year. John: Right. [Shoptalk] started in 2015. What do you think has changed since then? Bart: So much bigger. I mean I think the first one was, what? 3000 people or something like that? It was tiny. The thing with any show that blows up is just the amount of people you have, and how to corral that, right? The first one was great because it was like people who knew, or knew what who started it, kind of went to it and it was great. I liked it. John: Because it was more intimate. Bart: It was very intimate and I think getting it bigger is becoming interesting, so we’ll see what they do with it. John: But first, let’s talk about that notification on your Lyft app that there was an autonomous vehicle available. [Sadly!] We did not get that. John: Very sad about that. Bart: I think that wasn’t just for Shoptalk. I think that was just Vegas, they’re testing them out. You can get a car like that. They probably have like two of them, but that’s about it, and they come to you which is kind of interesting. John: I was hopeful we were going to get that. Bart:I know, me too. I was kind of disappointed. Oh, I wasn’t disappointed by our Lyft drivers. They were pretty fun. John: We had some pretty solid drivers all week, that was great. Other things about the show: The real benefit there is that they feed you. You get breakfast and lunch; they have breaks, which feature all kinds of goodies. What was the one day we had the shrimp and sushi and lobster? 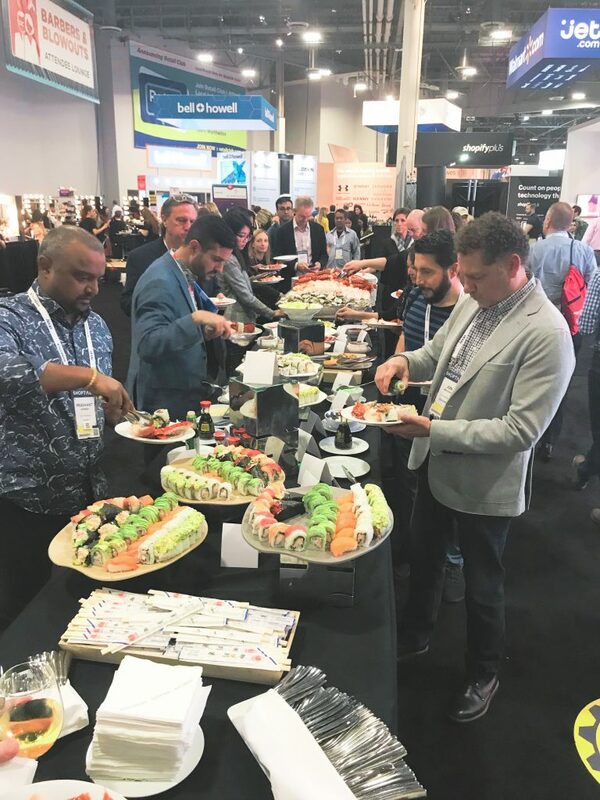 No one goes hungry at Shoptalk. John: Right, there’s no place to eat. You’re standing there kinda holding lobster in your hand, but it was really amazing. So, you go there more for, obviously, sales, because that’s your end of the company. John: I attended as many of the tracks and keynotes that I could possibly do. 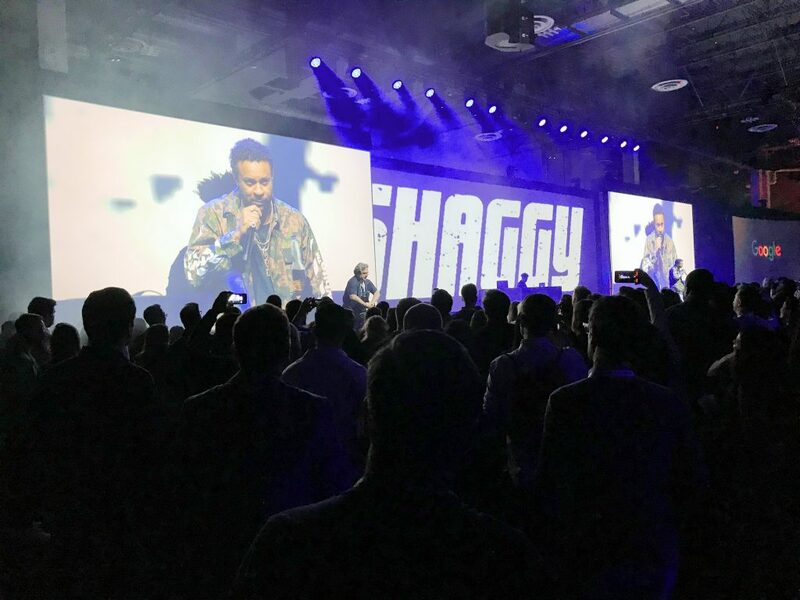 The interesting thing is I like to go to the show floor and learn about new technologies, obviously for this podcast and for our other podcast that we do, The Register, which we interview movers and shakers and CEOs in eCommerce and retail. So, I’m there to gather information and data for shows, and to meet people. We were there Sunday to Wednesday; we hit the show floor Monday and Tuesday. Solidly, I’d say, four or five hours each day, and I still didn’t even meet half the people that I wanted to meet, because the floor is just so huge. Bart: But I saw a whole bunch of people. I think they were more busier than the big booths. John: They definitely were, and I’m gonna talk about two people that I met. The one I met was the guy who actually won Startup Street. His name is Nicholas Fritz, his company’s called Rapidtag. He’s from Munich, a very nice guy. I saw Nicholas walking around the show floor because he was walking around with a giant check with 25 thousand dollars on it. They have an internet of things cashier-less checkout system. Basically ,you hold your smartphone, and if the item you’re buying has a Rapitag clip on it, your smartphone unlocks the tag and you just pay [with the app] and walk out of the store with it. I think you’re gonna see a lot more technologies like that, but his examples were, like, if you’re in a liquor store and you’ve got a 100 dollar bottle of cognac or whatever, you could walk up and go, “Bloop!” And then unlock it and you walk right out of the store. It’s pretty cool. The other really cool thing I saw, and I told you about this becuase I was super excited about it, is this company called Arylla. They print invisible serial numbers onto brand labels that can be read using a smartphone. It basically gives you the provenance of your thing that you’re buying. Not so much for a t-shirt, like you don’t care where a t-shirt has been. But I think it’d be super interesting for high-end goods that are resold, [like] a bag or sneakers. The resale sneaker market is huge. Let’s flip it on the other side. So, we go to the big booths. Obviously, Pitney Bowes had a giant booth. That was really cool. It was shaped like a box. You go to IBM, they had a super-sleek booth. Google had, of course, the biggest booth, because they were basically featuring a lot of different … Google-supported technologies. Visa does the same thing. They show off a lot of new payment methods. I went up to eBay. (This is gonna be a knock on eBay). I walked up to eBay and I saw they’re all kind of standing around, and there’s a video playing of this technology, I think it was called Heads Up. It’s [showing] shopping capabilities that people can use their eyes, it follows their eyes. This would be for people who are disabled. They can use their eyes to shop. So, I think a lot of these big companies are here because, “Okay, you’ve got money to spend for a booth. Put a booth in there.” I don’t know what they were selling, I don’t know what they were doing, I don’t know what kind of solutions they were providing. That really kind of put me off. That leads into, [we hear] the show is going to be changing. What’s neat is you’ve got this giant show floor. It’s huge. But in the back, [this year and last year], it’s a giant area where it’s almost like a dating thing. They’ve got these one-on-one meetings. I don’t know how this works. But there was 8,500 meetings where you could go and have a one-on-one meeting with a brand or a vendor. Apparently this is like a huge thing now. It was big last year; it was even bigger this year. Just imagine all these tables and then there’s like a wall in between each one, so conversations aren’t overlapping. And it’s got the vendor’s brand right on this plastic wall, I guess. A giant back of a convention area with all of these people just talking. They said it’s been so successful, they’re gonna cut down on the main show floor and expand it up to maybe 30,000 meetings. That is unconfirmed rumor; send Bart email, don’t email me. Bart: Because I think it’s like 10 or 20 grand for like 15 minutes. For 15, not 50. 1-5 minute meetings. Bart: Well, the reason they’re doing that is because they have a system to match you, vendors to retailers to whatever else, and that’s how that happens. It’s not like you just pick and choose. They literally just match you. You’re like, “I wanna meet retailers of this size,” and they’ll match you up to do those meetings, if those vendors wanna meet you. John: It’s crazy. Just to see it. They also have a thing that was new this year called Table Talks that brings groups together between six and eight people of similar seniority from similar companies to discuss topics. That was pretty cool. There’s a lot of really good networking, socializing things. They had a Shop Hop, which was like a pub crawl for retailers and brands. We did not participate, but we did witness Shop Hoppers while we were doing our own barhopping. And they have a ‘Drinks with Speakers’ program, where all the attendees of the show can drink with the speakers. I think that would be a little uncomfortable for some of the speakers, because obviously one guy that might be a little popular, like Marc Lore was there. You imagine how many people would wanna talk to him as opposed to some other guy. Bart: But, from what I understand, I think they were required to do it. John: Yeah, they have to. [As] part of their contract. You can gather a lot of information in a very short time, and these guys get up to demo. Obviously, some of these guys aren’t very good at it. Bart: No. But it’s a good way to get out there and work on your pitch. John: The problem is you’re on the show floor and it’s crowded, it’s busy, and people are walking by, people getting up and moving, but it’s a good way to get up there and just hone your pitch. Like I say, some of them were really good, some of them not so much. Bart: Which is fine, because that’s where you [practice] before you get on the big stage. 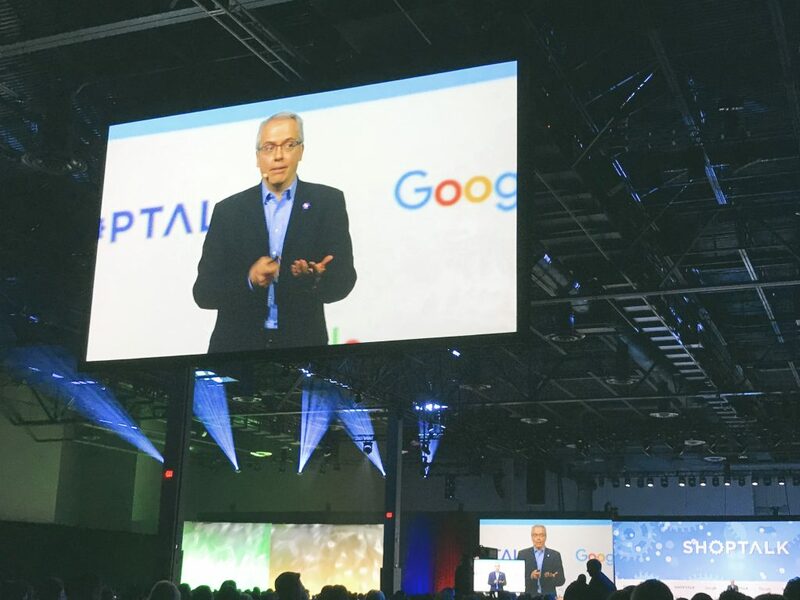 Daniel Alegre, President, Retail Shopping and Payments at Google. Bart: But I think if you listen to everybody on the floor and stuff like that, Walmart has that stat too. Because they’re pushing those kinds of things. I think they all are having those kinda same deals. There were a lot of buzzwords. I was reading [somebody else’s recap]. She said, “Pivot is no longer the buzzword. This year was ‘intent’. You have intent to spend” … Customer intent, that’s a big thing. And the other one we heard, actually this is the first time I heard it. The CEO of Lowe’s used this word, “Footsteps.” Because now it’s getting more granular into the customer experience within a store. If you’ve got an app, and every major retailer now has the app, and they’re hoping that you’re walking around the store with the app, they’re tracking your footsteps. Now they can figure out which parts of the store are dead. And I think that’s gonna be the new buzzword you’re gonna hear in 2019 is “footsteps,” because they are tracking your footsteps, ladies and gentlemen. In closing, as we said, there might be some changes in shop talk. The show floor might get a little smaller. They’re also branching out and going regionally. They’re launching a thing. He announced it, actually, at the show. It’s called Retail Club. Retail Club will organize local, small-format gatherings for retail professionals throughout the year across the US, starting in New York City. Other cities will follow. You can check that out at Retailclub.com. I signed up and they didn’t tell me to go away, so maybe they’ll let me join their club. I wanna be with the cool kids. Bart: You’re already a cool kid. John: And next year’s Shop Talk is moving. It’s moving to Mandalay Bay. It’s not at the Venetian anymore. That’s kinda weird. Is Mandalay Bay’s convention area bigger than the Venetian? Bart: It’s actually bigger. It’s huge. But, also, you went to the Venetian last year. It was at the Aria, all the years before that. John: Oh, was it? I did not know that. Bart: It was at the Aria. The Venetian has the bigger one. And Mandalay Bay really has a big one. That’s where MAGIC is. MAGIC is at Mandalay, usually, in the convention center. So, I think they’re all moving. Yeah, it’s a lot bigger. John: I’ve been to Mandalay, but not to ‘conventionize’. I’ve been there to ‘socialize’. Bart: Yeah, they have a special convention center, so it’s definitely interesting. John: And it’s later this year. It’s March 22nd through the 25th. This year it was early and last year it was on St. Patrick’s Day, so I flew into Las Vegas on March 17th, which was St. Patrick’s Day, and also the first day of March Madness. It was a day I will never forget. I got to see Las Vegas in its raw, primal state. It was amazing. Bart: And I went to a different conference in Miami, which I saw March Madness, St. Paddy’s Day, and Spring Break, all at the same time in Miami Beach. So, that was interesting. John: Any closing thoughts? Because my closing thoughts are when in Vegas, make sure you stay hydrated and get some sleep. That is key advice, my friend. Bart: Sleep and being hydrated is very, very important. I think the biggest thing is, try not to over drink.